Derric has been nominated for: Best Performance in an Animated Series or TV Show DerRic previously Won the Gemini for Best Ensemble Performance Wapos Bay. The Academy of Canadian Cinema & Television announced that Wapos Bay, the stop motion animated children’s series broadcast on APTN and SCN, has received five Gemini Award nominations. The 25th Annual Gemini Awards ceremony will be held in Toronto November 2nd and 3rd, 2010. 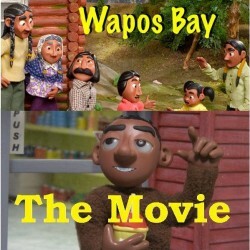 Wapos Bay is among five productions nominated for Best Animated Program or Series. DerRic Starlight, the voice behind the character of Devon, received a nomination for Best Performance in an Animated Program or Series. Trevor Cameron earned two nominations; one for Best Direction in an Animated Program or Series, and one for Best Writing in a Children’s or Youth Program or Series, both for the episode, The Hardest Lesson. Ross Nykiforuk joins the list of nominees for Best Original Music Score for an Animated Program or Series (The Hardest Lesson). The announcement comes on the eve of the broadcast premiere of Season 5 on APTN, the launch of the digital media properties, and production for the Movie of the Week commencing in January. Wapos Bay season five premieres Wednesday, October 6th, 2010 on the Aboriginal Peoples Television Network (APTN) with special guest star David Suzuki (The Nature of Things). Saskatchewan Communications Network (SCN) broadcasts seasons three and four. Wapos Bay Productions is currently in pre-production for the Movie of the Week.